The Road Safety Award is designed to support sustainable road safety initiatives, as part of the company’s corporate and social responsibility. It acknowledges and rewards the contributions to road safety of public authorities worldwide. 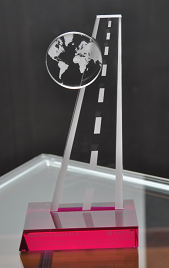 The prize is bestowed by Evonik upon identification of the winner by an independent jury of internationally recognized experts in the field of road safety, transportation and city design. The jury consisted of Susanna Zammataro, Director General of the International Road Federation in Geneva, Dr. Suzy Charman, Executive Director of the Road Safety Foundation in the United Kingdom, Prof. Dr. Marcus Oeser -Head of the Chair-Professor for Pavement Engineering & Director of the Institute for Pavement Engineering at RWTH Aachen University in Germany and Rudolf Keppler, former deputy leader of the section “Street Equipment” at the German Federal Highway Research Institute (BASt) responsible for road markings and member of various technical committees in the road marking sector. Key criteria for the winning project/initiative are its contribution to road safety (60%) and sustainability (20%) as well as its innovative character (10%) and potential replicability (10%). 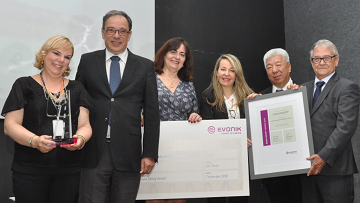 The Evonik Road Safety Award is endowed with €10,000 and granted in the form of a sponsored road marking application, a donation of traffic safety related items, or a donation to a non-profit organization. 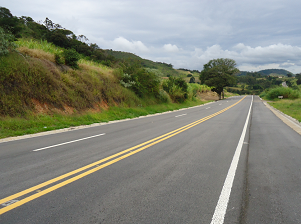 This year, the panel of international road safety specialists chose the project “Assessment of more visible road markings - Roads in the state of São Paulo” of DER-SP as winning initiative. With the project, DER-SP is aiming at reducing the number of road accidents by implementing effective systems to evaluate the performance of safety elements applied on the roads. The jury acknowledged the solid research approach and claimed that the initiative is an excellent example of data-based decisions and interventions. Furthermore, the panel concluded that the findings are practical and useful to prove that highly durable horizontal structured road markings retain its retroreflectivity for a longer time, especially at night and under wet conditions. This directly improves road safety and enhances the visibility of the markings even in conditions that are critical to drivers. The three-year study conducted by DER-SP assessed several technical features relating to the visibility of commonly used road markings both in dry and wet conditions consideringoccurrences and maintenance interventions, and statistics of road traffic accidents in the period.The retroreflectivity levels of the structure and multidots cold plastic systems were about 130% higher, even after three years of use, when compared to flat hot road marking systems, and such a retroreflectivity index was far above DER-SP’s minimum requirements, even in wet conditions. The award ceremony took place in the city of São Paulo and was attended by the Secretary of Logistics and Transportation of the São PauloState, representatives of DER as well as the Fundo Social de Solidariedade do Estado de São Paulo(Fussesp) and other government officials. During the ceremony, DER’s CEO,Mr. Raphael do Amaral Campos Junior, pointed out that the markings resulting from the structure and multidots cold plastic road marking system showed a superior performance when considering reflectivity in low visibility conditions, such as at night or in wet conditions. “The outcome was positive as we recorded no accident with fatalities, a goal towards which DER has been working hard over the years. The award is also the fruit of the initiative launched by DER-SP through its Technology Committee, which is always on the lookout for new products and techniques capable of improving road safety and providing driving comfort to the users of our roads,” he said. The prize of €10,000 was donated to Fussesp, a local charity organization which engages in non-profit social work with the aim of improving the quality of life of the poorer population of the state of São Paulo. The call for applications for the Evonik Award 2019 will start in the first trimester of 2019. Check IRF website www.irfnet.ch for updates.